David Szanto is a PhD student in gastronomy at Concordia University, exploring the material-discursive practices of food. His aim is to better understand the systemic, intra-active relationships between humans, food, and the processes that frame what is at once a mundane act as well as a magnificently complicated daily performance. A former process facilitator and project manager with 20 years of experience in consulting, communications strategy, and editorial work, David also teaches food studies and gastronomy courses at Concordia and the University of Gastronomic Sciences in Italy. Basil AlZeri is an interdisciplinary, Toronto-based Palestinian artist working in performance, video, installation, food, and public art interventions/projects. His work is grounded in his practice as an art educator and community worker. He is engaged with the intersection of everyday actions and life necessities with art. Given the context of a space, his work strives to interact with the public through gestures of generosity in social interactions and exchanges. AlZeri’s performance work has been exhibited in Toronto (FADO, Nuit Blanche, Whipper Snapper Gallery), Quebec (Fait Maison 14), Winnipeg (Central Canadian Centre for Performance), and Mexico (Transmuted International Performance Art Festival, Performancear O Morir). Upcoming projects include a public performance project with the Ottawa Art Gallery/Creative Cities Conference, VIVA! ART ACTION Montreal, and performances in Chile And Argentina in 2013. 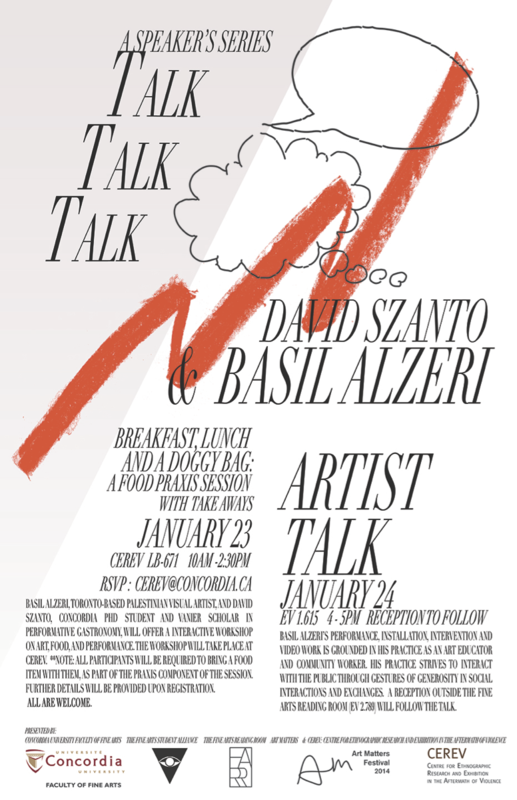 Breakfast, Lunch and a Doggy Bag: A Food Praxis Session will be presented in conjunction with Basil AlZeri’s artist talk at Concordia on January 24, 2014 running from 4 – 5 PM in EV 1.615. 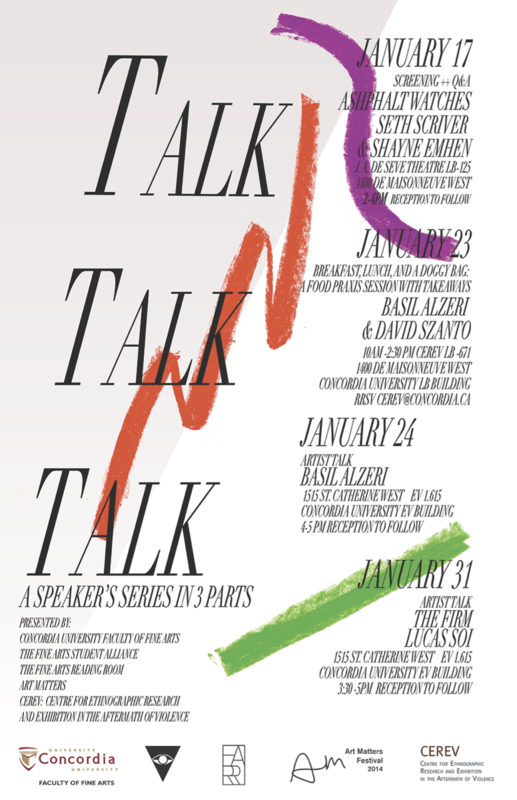 These events are part of Talk Talk Talk, a speaker series produced by Concordia’s Fine Arts Reading Room, Art Matters Festival, and the Fine Arts Student Alliance (FASA).